English poet; brother of Benjamin and Lewis Gompertz: born 1774; died 1856. He wrote: "June, or Light and Shade," a poem in six parts, London, 1815; "The Modern Antique, or the Muse in the Costume of Queen Anne," London, 1813; "Devon, a Poem," Teignmouth, 1825. Gompertz was much admired by his contemporaries; Dr. Jamieson, in his "Grammar of Rhetoric" (p. 357), classes Gompertz with Dryden, Pope, Addison, and Gray. Dict. Nat. Biog. s.v. 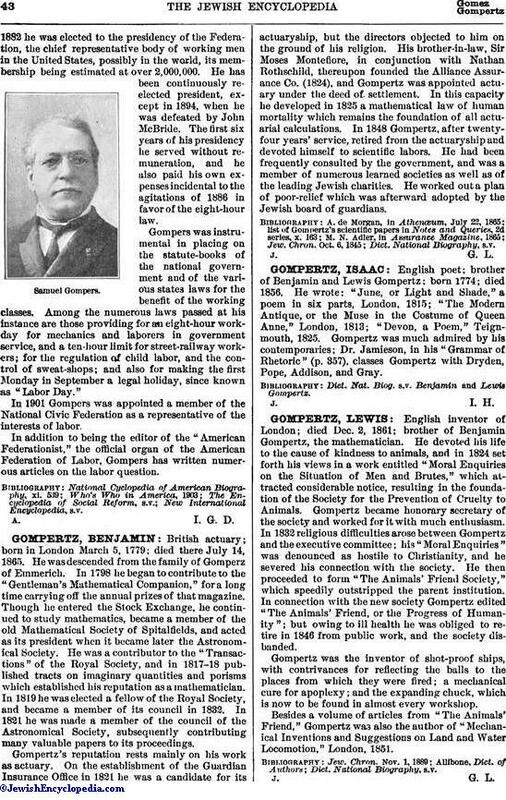 Benjamin and Lewis Gompertz.